Put your brand face to face with your prospective students using Search Engine Optimization (SEO) strategies! How is your online positioning? Having a great online position can be the difference between having to invest heavily in marketing to attract students, instead of making effective use of your reputation and credibility to have prospects come to you. 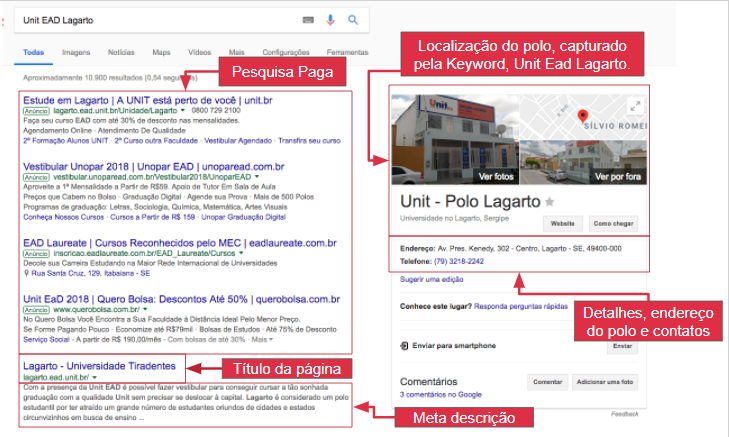 When your educational institution appears in Google's first organic search results, generating prospects is much easier, since more than 90% of the clicks are made to institutions in the first three positions of the SERP. And how do you get to the top of these search results? With Search Engine Optimization Or Simply SEO! Optimizing educational institution websites for search engines can’t be limited to simple checklists or best practice tutorials. A true SEO strategy involves intelligence and a good deal of knowledge about your market: the educational one. What does that mean? That in addition to optimizing the titles, subtitles and meta descriptions of your site, you also need to anticipate what the competing institutions are doing. What strategies do they use? Why? SEO is a competition, so put your educational institution in a position to win by using professionals that know how to compete in this over-crowded space! What to Expect from an SEO Strategy? SEO involves a lot of strategy, including design, loading speed and ease of navigation. The friendlier your site is, the more comfortable visitors are, and the longer they stay. The website of an educational institution is its online headquarters, so it should receive all the traffic generated by all its digital marketing activities. With the right optimization, you make your site easy to find on the internet. A well-optimized website with SEO techniques becomes a true magnet for visitors. Do you know why? More than 90% of all internet clicks are for the first three search results. The biggest goal of SEO is to attract the right leads to your educational institution, those who are ready to enroll and contribute to your results. To do so, you must select the right words, terms, and strategies. A credible site is one where your URLs are friendly, your meta description is clear and assertive, and users know exactly what they will find on each page. How to achieve this? With Search Engine Optimization! SEO contributes to reducing your educational marketing costs, especially the high expenses from paid advertising, or the famous sponsored links. When organic positioning is good, there's no reason to spend money on keyword buys if you're always at or near the top of the first page of a Google search. SEO strategies also contribute to improving the user experience within your website. That's because with the right tools, we optimize the elements that should have more prominence, using the keywords from the content you’ve already created! If you get more qualified leads and have obtained more credibility by providing quality content on your site, enrollments arrive more quickly, with less effort from your team of enrollment advisors, and the students enrolled will have better retention rates, too. Here at MKT4EDU, technology and professionalism go hand in hand! That's why we use the most innovative technologies in SEO analysis to make your educational institution more visible online, and prepare it to help you scale up to reach your enrollment goals! With SemRush, we do a detailed analysis of your site and we identify the best optimization strategies for your pages. This work is complemented by Moz, another SEO analysis tool that brings powerful insights to leverage your institution's website. And if your site and blog are with our team, we use Hubspot, which allows you to track your results in real time on an intuitive dashboard. Here at MKT4EDU we are all about technology, so we also use Google Analytics and Google Search Console to boost SEO strategies and make your educational site reach the first page of Google! Why do SEO with MKT4EDU? We specialize in education and have extensive experience in marketing consulting for educational institutions. Our know-how allows us to more accurately evaluate each optimization action by search engines, and generate better results for you. Making use of the latest technologies, our SEO experts are able to work their way to success for any educational institution: the first three positions in Google's organic results for hundreds or even thousands of keywords. Do you want to be at the top of the search results? Contact us!